Tom Selleck owes me an apology. Anyone my age knows the unobtainable standard he set for a teenage boy just coming into maturity. Why, do you ask, am I seeking contrition from him? All the ladies? No…well maybe. I’m talking about the hair…his stinking perfect hair. When all of the girls had a picture of the Magnum PI in mind, how could any of us real boys measure up? Curly coiffure, bushy mustache, chest hair, leg hair… There it is! Leg hair. Recently, smooth has become stylish and I would have been perfect for this new generation. But that isn’t my generation. When I was in high school and college, the girls wanted hair and lots of it. Hair I didn’t have. Well, that’s not absolutely true. Science should study my leg hair because it is translucent like that of a polar bear. It’s there, just not to the naked eye. It only shows up if I have a deep tan, which is near impossible for someone of Swedish/Germanic descent. Undaunted, I went to the pool, laid out, and held my legs just right so that passing females might possibly get the proper angle to spot a few strands. As a freshman in college, I went so far as to purchase a tanning package. I donned little glasses and laid on top of the plastic surface to bake. And bake I did. Remember the shorts Magnum used to wear? Not long like they are today, 80’s shorts came way up on the thigh. Hoping my tan would expose leg hair from the top of my leg to my toes, I even pulled them up higher. Oh yeah, I got burned in very sensitive areas. It hurt for weeks and didn’t help my hair stand out whatsoever. We all have physical characteristics we would rather minimize or hide completely. Just the other day, I was talking with a friend who told me her 10 year-old daughter E had been called fat by another girl. My heart sank. Her sweet little girl is now self-conscious about something as irrelevant as my smooth legs. She is active and isn’t overweight in the least, but also isn’t waif-thin like so many women our society seems to put on a pedestal. Such a tragedy. I want so much for her and other little girls to see what truly matters about themselves instead of what is fleeting. Your beauty should not consist of outward things … Instead, it should consist of what is inside the heart with the imperishable quality of a gentle and quiet spirit, which is very valuable in God’s eyes. That’s what is important. I hope my daughters know that. I pray little E learns that too. We have to tell them they are beautiful and keep on telling them until they understand. That’s how God sees them. So Tom, whenever you are ready, it has taken 25 years, but I am finally over your provocation and prepared to accept your apology. It’s been a long time coming. If it’s any consolation at all, I have never liked hairy men. I wouldn’t give my uncle a kiss because he had a beard. I have a friend that is very, I mean, very hairy that his back, shoulder and chest hairs pop out of his shirt. One day I asked him if he trims it in order to promote growth. We got a kick out of that. On a more serious note, I totally agree with you about the beauty aspect. I’m not totally against a girl taking care of herself and enhancing her natural beauty at all, but I am totally against placing value on physical appearance. I feel for your daughter’s friend. I know how it is, and until today I still suffer with this search for perfection. Ugh! Thank you. It’s really sad, one comment & esteem is shot. She will rebound, I’m sure. “All the ladies? No…well maybe.” I burst out laughing! I’m glad. He did have his day in the sun! Amazing how long a comment or two can stick with us. She hasn’t even hit her growth spurt yet, and might be stick thin in the end – and still might have a stigma about her weight. Cheers from all of us who had problems with our legs, right? So, you know Tom still has his hair. After his guest stints on Friends he played Jesse Stone in the TV movies from the Robert B. Parker novels and now stars in Blue Bloods. There are people, male and female, with what I call Power Hair. Think JFK and Jackie O. Or Rita Hayworth and Cary Grant. I suspect their hair gave them confidence far beyond that we mere mortals ever enjoy. So you had Tom Selleck, I had Farrah Fawcett. Thank goodness we outgrew comparing ourselves to movie stars. Thank you, Mandy. Tom hasn’t come around though. 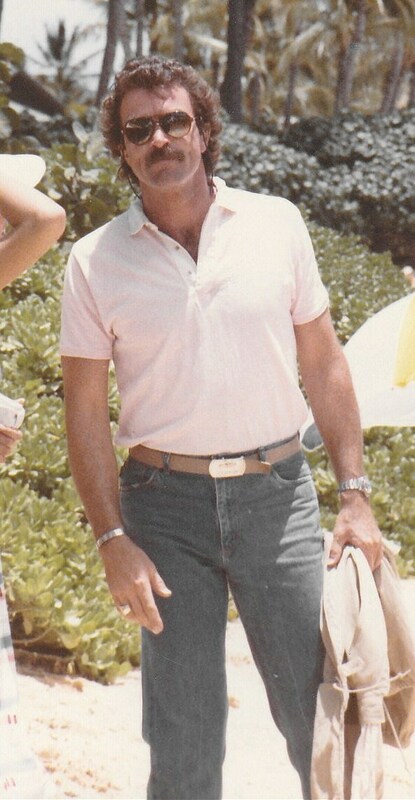 I enjoyed Tom Selleck’s acting (movies especially) but actually paid no attention to his hair, just knew it was dark. You on the other hand are a good writer which Tom probably is not. Thank you. I envied his hair, mine was straight – no waves.